This montage of Chandra images shows a pair of interacting galaxies known as The Antennae. Rich deposits of neon, magnesium, and silicon were discovered in the interstellar gas of this system. The top image, a wide field X-ray view, reveals spectacular loops of hot gas spreading out from the southern part of The Antenna into intergalactic space. Also shown are huge clouds of multimillion degree gas and bright point like sources due to neutron stars and black holes. The image is color coded so that low, medium and high energy X-rays appear as red, green and blue, respectively. Direct hits between stars are extremely rare when galaxies collide, but huge gas clouds can crash into each other at high speeds, creating shock waves that heat the clouds and the surrounding gas to millions of degrees. 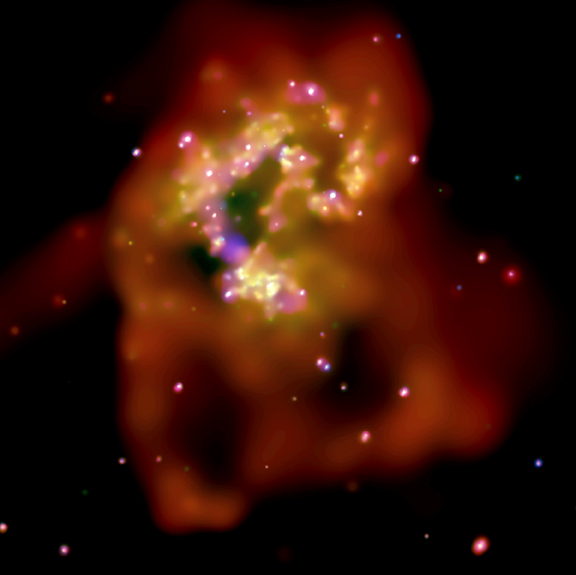 In the closeup view on the lower left, also color coded by X-ray energies, the point sources have been taken out to emphasize the hot gas clouds in the central regions of The Antennae. 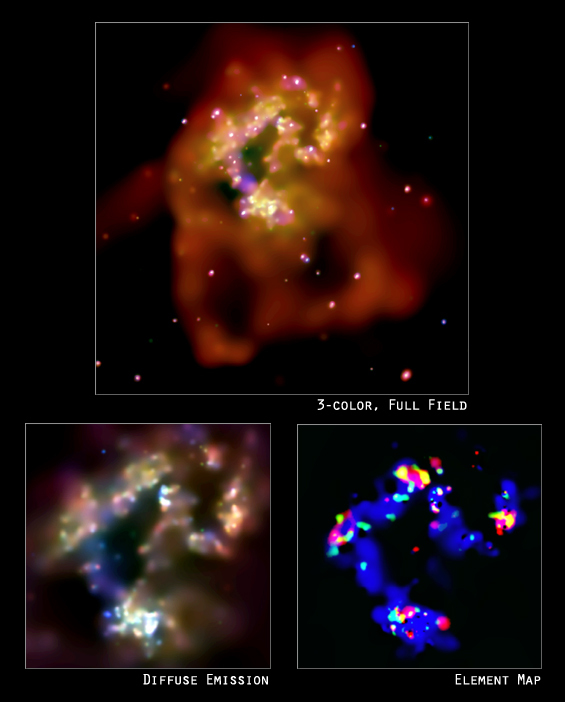 Collisions between the gas clouds may trigger a stellar baby boom. The most massive of these young stars race through their evolution in a few million years and explode as supernovas. Heavy elements manufactured inside these stars are blown away by the explosions that further heat the gas clouds and enrich them with heavy elements such as neon, magnesium, silicon and iron. The image at the lower right is processed and color-coded to show regions rich in iron (red), magnesium (green) and silicon (blue). These are the types of elements that form the ultimate building blocks for habitable planets. Enrichment from supernovas occurs in all galaxies, but usually the new elements are observed in a highly diluted form as they are mixed up with the rest of the interstellar gas. This Chandra image is remarkable in that it shows clouds in which magnesium and silicon are 16 and 24 times as abundant as in the Sun. As the enriched gas cools, a new generation of stars will form, and with them new planets. A number of studies indicate that clouds enriched in heavy elements are more likely to form stars with planetary systems. Several hundred million years from now, an unusually high number of planets may form in The Antennae. Scale Image is 4.8 arcmin across. References G. Fabbiano et al. 2003, Astrophys. J. Letters (in press), "X-raying Chemical Evolution and Galaxy Formation in The Antennae"